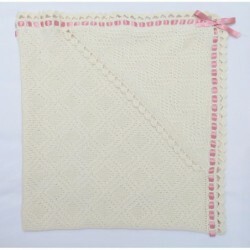 This lovely baby blanket in nice cream color, which is made of merino wool yarn with a touch of cashmere for a luxurious, cosy feel! Merino wool is hypoallergenic, can be used even for newborns. It keeps temperature under the clothing, it means baby will not feel hot. On one of the corners is a bunting style hood which provides a warm, safe place for babys head when using the blanket to swaddle. The blanket is finished with a satin ribbon (colour may be changed). It is very soft and warm! The blanket is perfect for cold weather to cuddle up your child, make your little one cozy and warm. CARE INSTRUCTION: washing water temperature should not exceed 40 C. Dry flat, do not bleach or tumble dry. Iron low heat, do not hang. If you are interested in other colours please have a look in our yarn shop www.alevig.eu, please don`t hesitate to contact me!